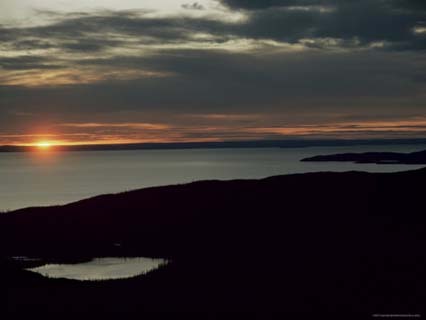 At 31,153 sq km (12,028 sq mi) Great Bear Lake is the largest lake (entirely) within Canada, and the third largest lake in all of North America. Lake Superior and Lake Huron, two of the Great Lakes on Canada's border are larger. Positioned within Canada's Northwest Territories, and dissected by the Arctic Circle, this extremely remote body of water is usually frozen solid from late November to the end of July each year. On its southwest corner, near the small community of Deline (pop 540), the lake drains into the Mackenzie River through the Great Bear River.